10 Airs for High Voice, Vol. 1. Composer: Jean-Philippe Rameau #1-5. D4-B5. French. 10 Airs for High Voice, Vol. 2. Composer: Jean-Philippe Rameau #6-10. D4-Bb5. French. 10 Airs for Medium Voice, Vol. 1. Composer: Jean-Philippe Rameau #1-5. A3-F5. French. 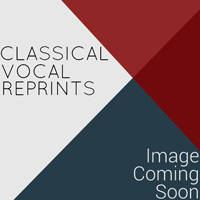 10 Airs for Medium Voice, Vol. 2. Composer: Jean-Philippe Rameau #6-10. A3-F5. French. 10 Biblische Lieder, Op. 99. Composer: Antonin Dvorak Eb4-Ab5. Czech/German/English. Composer: Gabriel Grovlez Medium. C4-F5. French/English. Composer: Ernest: Moret High. C4-A5. French. Composer: Sigfrid Karg-Elert Medium-High. B3-Ab5. German. Composer: Anton Krause For Piano. Vol. I & II Combined. 10 Gesaenge aus Julius Wolff?s LURLEI. Composer: Hans Jung 2 Vols. in 1. High. C#4-B5. German. Composer: Elsa Laura von Wolzogen Voice & Guitar or Lute. A3-F#5. German. Composer: Volkmar Andreae From Op. 10, 12, 15 & 16. A3-A5. German/Swiss. Composer: Milia Balakirev Medium. B3 ? Gb5. Russian/German. Composer: Wilhelm Berger Various Ranges. G3-F#5. German.